It’s been many years since my last product review of a protein skimmer. I’ve been reluctant to revisit skimmers because that last review, written for the now-defunct print publication, Aquarium Frontiers, caused a lot of controversy. Aquarists are very passionate and opinionated about their skimmers. Perhaps it’s just a mechanism to justify the large sums of money we spend on these devices. Regardless of the reason, there is a loyalty towards types and brands of skimmers that doesn’t exist with other reef equipment. I’ve also avoided writing about skimmers because they’re difficult to compare and “test.” The best I can offer are my subjective opinions; although they’re based upon having used or seen just about every skimmer offered for sale to marine aquarists. Similar to many reef aquarists, I keep a reef aquarium without a sump. It’s a 42 gallon hex tank that contains a mix of SPS corals, soft corals, and anemones. For years I’ve struggled to find a quality hang-on-the back (HOB) skimmer for this aquarium. There are plenty of choices in HOB skimmers but only a few that I consider “high-quality.” There’s been a lot of buzz lately about the Deltec HOB skimmer so I thought I’d give it a try. The Deltec MCE600 skimmer is similar in design to the company’s other models. It’s an aspirating skimmer that mixes air with water through the intake side of a submersible pump. The key to its operation is the “needle-wheel” impeller that “chops” the air into the finest of bubbles. It’s regarded as the most efficient design in skimmers for mixing air with and water. The Deltec MCE600 skimmer sits on the lip of the aquarium and is held in place with a plastic clamp. It requires only 3 inches of clearance behind the aquarium. The only piece that intrudes into the aquarium is a clear intake pipe. This was a big consideration for me because my previous HOB skimmers were all designed to operate with the intake pump hanging inside the aquarium. This took up a lot of valuable space inside an already small aquarium and made it more difficult to maintain. In addition, it just looked plain ugly. Although the Deltec skimmer was designed to hang on the back of an aquarium, it can also hang on the outside of a sump or sit inside a sump. One of the advantages of a HOB skimmer, compared to an in-tank or in-sump skimmer, is that its operation is unaffected by the level of water in the aquarium or sump. Installing the Deltec MCE600 skimmer is as close to plug ‘n play as it gets. There is essentially nothing to assemble other than the intake pipe. After filling the skimmer box with tank water, which is necessary to prime the pump, you simply plug it in. That’s it. There is an initial setting of the cup height and air-intake valve that will have to be re-adjusted after 24 hours of operation. If you haven’t used a HOB skimmer before, you might get nervous about the large amount of air bubbles returning to the aquarium when you first start the Deltec MCE600. This is normal and will dissipate after a few days. It’s due in large part to the plasticizers used on the acrylic and PVC parts. In fact, after a few days of operation, the water return from my Deltec skimmer was essentially bubble-free. The skimmer comes with a diffusing plate on the output to further reduce the incidence of stray air bubbles but I found this wasn’t even necessary; however the diffuser plate does reduce splashing and should be kept in place. For this same reason, it may also take a few days to a week for the skimmer to “kick in” or begin producing a dense head of foam. The Deltec MCE600 in is well-made of acrylic and PVC parts. Most of the box and plastic components are black or opaque to reduce the incidence of algae growth inside the skimmer. The back side is clear, which allows you to see inside the skimmer box and observe the pump in operation. The skimmer completely disassembles through a series of sliding covers and partitions and it is very easy to clean and adjust. The height of the collection cup is set with a nylon screw. There is a pipe at the top of the collection cup that directs water back into the skimmer in the event that the skimmer overflows, thus making the skimmer “flood-proof.” There is no built-in option to collect the skimmer effluent in an external container. This is done purposely and serves to eliminate the possibility of water overflowing onto the floor. If you must collect the effluent in an external container, this can be done with a simple modification: cut the overflow pipe, attach a length of vinyl tubing to the cut end, and direct it to a container or drain. Another feature that I really like about the Deltec HOB skimmer is the built-in media chamber. It enables you to add a bag of carbon, phosphate-removing compound, or biological media in the path of the outflow. This is an important attribute when you don’t have a sump. I also hide a small titanium heater and temperature probe inside the skimmer box! 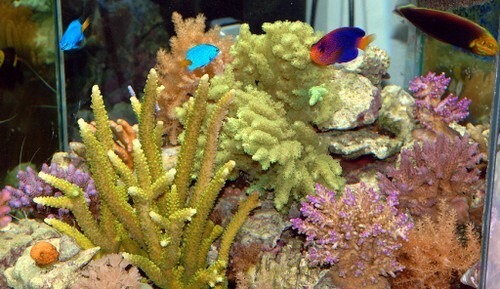 Although I don’t use ozone on my reef aquariums, the Deltec skimmer can accommodate ozone. Simply attach a length of ozone-resistant airline tubing (silicone or norprene) to the intake side of the venturi valve. Attach the other end to the output of the ozone generator. Ozone-laden air will be automatically drawn into the skimmer. This setup doesn’t require an additional air pump. The manufacturer recommends using a maximum of 25 mg/hr of ozone. Although the skimmer can withstand higher amounts of ozone, amounts in excess of 25 mg/hr are not recommended for the typical aquariums that employ this skimmer. The skimmer cup should be emptied and cleaned every 2-4 days or as required. The build-up of skimmate on the walls of the collection cup can greatly reduce skimmer performance. Deltec also suggests turning off the power to the aspirating pump at the same time. This causes water to back up into the aspirating valve and venturi tubing and serves to dissolve accumulated salt deposits. I also occasionally stick the venturi valve into a few ounces of warm RO water while the pump is running to clear it of dust and salt. Every few months the needle-wheel and impeller housing should be thoroughly cleaned of any debris and calcium deposits. It is recommended to soak the pump and impeller in white vinegar for a few hours or overnight, if necessary. 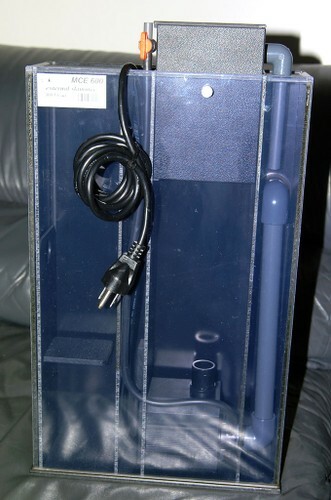 The unobtrusive design: There is no pump in the aquarium and the skimmer box only extends 3 inches behind the aquarium. The media chamber, which allows me to use chemical media and hide equipment. The ease of cleaning: The collection cup simply lifts out and takes under a minute to rinse and clean. When it comes time for a more thorough cleaning, it’s easy to disassemble the entire skimmer as well. Deltec claims that the MCE600 skimmer is suitable for use on aquariums from 100 to 186 gallons, depending upon the stocking levels. I believe this is a fair recommendation, but I tend to be conservative when it comes to skimmers. I would recommend it for aquariums up to 90 gallons, because, as we all know, every aquarist eventually overstocks their aquarium. For more information, including local dealers and pricing, I suggest visiting the Deltec USA web site at: http://www.deltecusa.us/ .